So Lonely in Gorgeous: Invest In Your Hair! My last post was about my spring hair color. 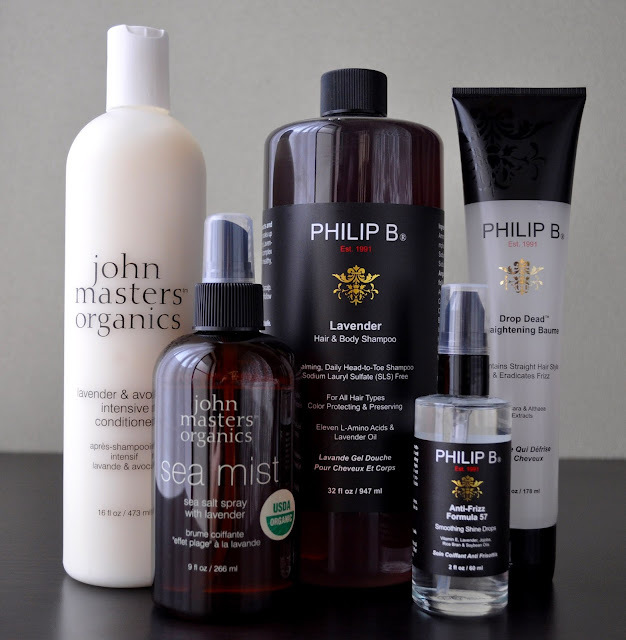 So, here are the products I've been using this season to keep my mane healthy and manageable. Philip B Lavender Hair & Body Shampoo (14,600 yen): aside from sakura, Spring is all about the Lavender. First, I'll address the positives: Philip B's Lavender Hair & Body Shampoo has a great scent that lingers for the entirely of the first day. It cleans thoroughly, and removes all excess oil and residue from the scalp. However, you have to use a lot of product because it doesn't lather well at all. Also, I need to follow up with a good conditioner because after rinsing, my hair is tangled and feels dry. John Masters Organics Lavender & Avocado Intensive Conditioner (7,776 yen): a pleasing, delicate lavender scent, the Lavender & Avocado Intensive Conditioner has a thin, lotion consistency. I apply a dollar-size amount to the mid-lengths of my hair to the ends. Great at detangling, I usually leave it on from anywhere between 5 to 10 minutes. after rinsing with cold water, my hair is tangle-free, soft, moisturized, and shiny without being weighed down. I really like this conditioner. 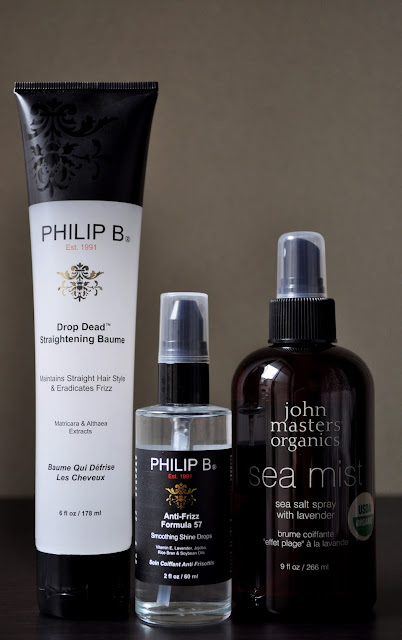 Philip B Drop Dead Straightening Baume (3,780 yen): a heat-activated, silicone-free, non-greasy, water-soluble formula protects my hair from thermal styling and helps cut down on my blow-drying time. I like to apply a mix this along with the Anti-Frizz Formula 57 to damp hair. Afterwards,my hair feeling and looking extremely soft, voluminous, sleek, shiny and frizz-free. Philip B Anti-Frizz Formula 57 (5,292 yen): the lavender oil is this product gives it a delicious lavender scent. I like to mix four pumps into the Philip B Drop Dead Straightening Baume for extra shine and protect from heat styling. Also, I use it as a finishing polish to on the mid-lengths of my hair to the ends. John Masters Organics Sea Mist Sea Salt Spray with Lavender (3,240 yen): Another delectable lavender fragrance (can you see a pattern here?!) , I like to use this salt spray on my roots to add volume and texture, as well as adsorb any excess oil between washes. 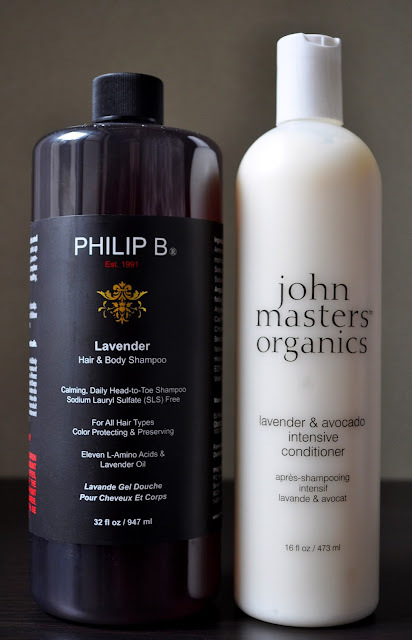 Although after rinsing the Philip B Lavender Hair & Body Shampoo out, my hair is left feeling dry and tangled, when paired with the John Masters Organics Lavender & Avocado Intensive Conditioner, and the Philip B Drop Dead Straightening Baume, and the Philip B Anti-Frizz Formula 57, my hair feels extremely soft, silky smooth, and with an incredible shine.